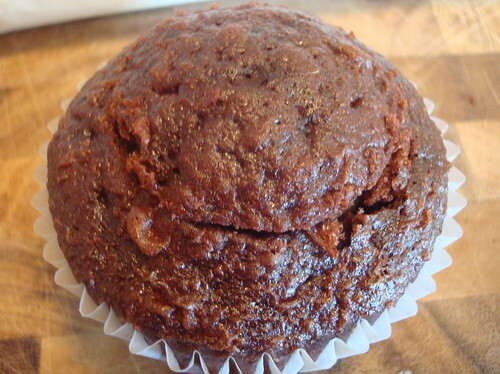 So you've filled your pans, baked the cupcakes, let them cool and your house smells like heaven. 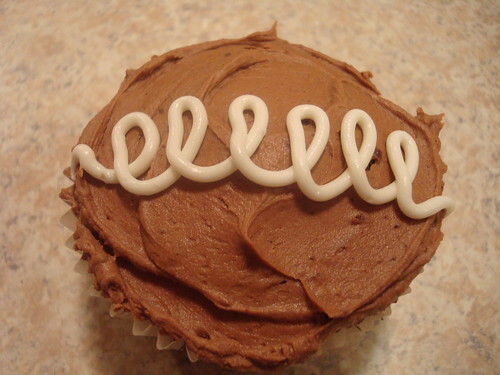 Have you decided how you want to decorate your cupcakes yet? May I suggest an easy variation on the theme? One that provides a little surprise for the lucky recipient? Fill them with frosting! 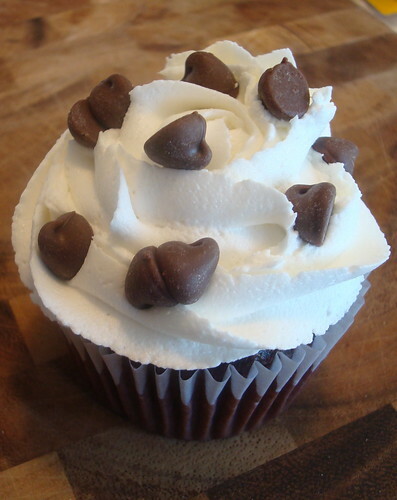 You'll need a piping bag and a decorative tip. 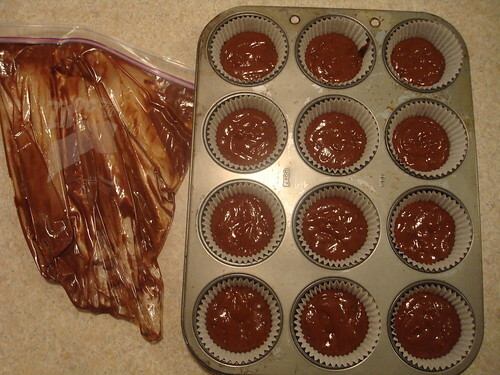 You don't need a decorative tip for the filling in the cupcakes, but since I am filling the cupcakes with the same frosting I am decorating them with, I used the same bag & tip for the whole thing. The tip I used is over-sized. 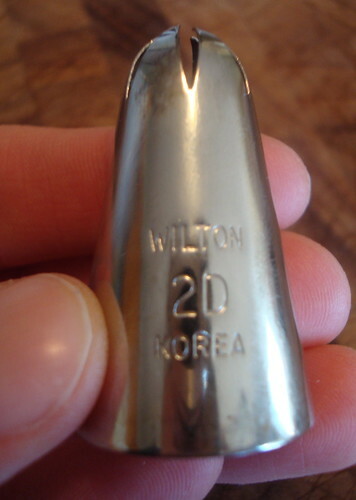 It is a Wilton 2D. 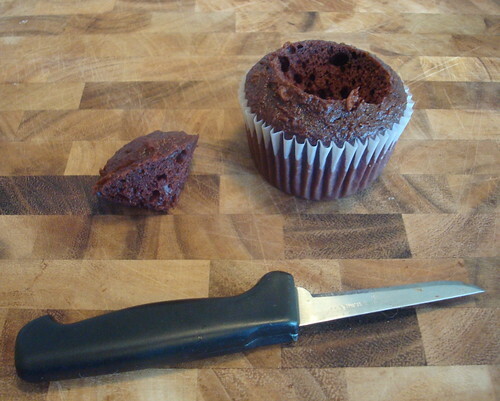 Take a small sharp paring knife and cut a cone shape from the top of your cupcake. 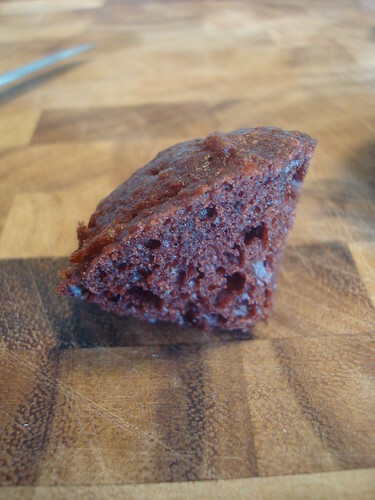 It should be fairly deep (half the depth of your cupcake). 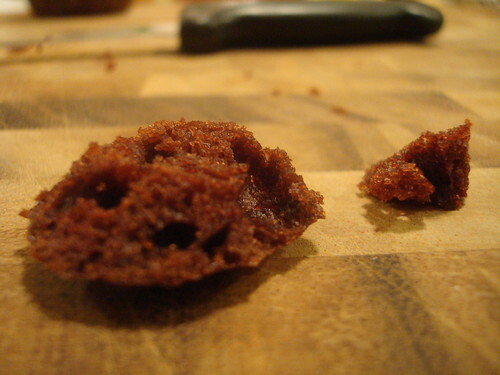 Make sure your cupcake is completely cooled before you do this or you will create for yourself a mess of crumbs. 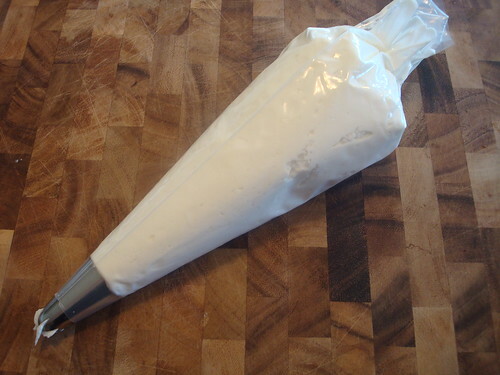 Turn the cone on its top and slice the tip off so it has a nice flat bottom. Go ahead and eat what you just cut off. You won't need it later and you deserve a taste. 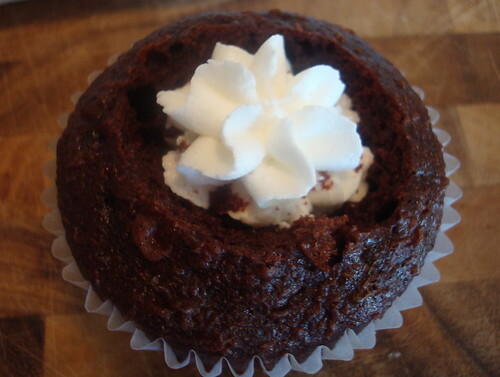 Now put your piping tip into the hole you created and fill that cupcake up! Then put your cap back on. 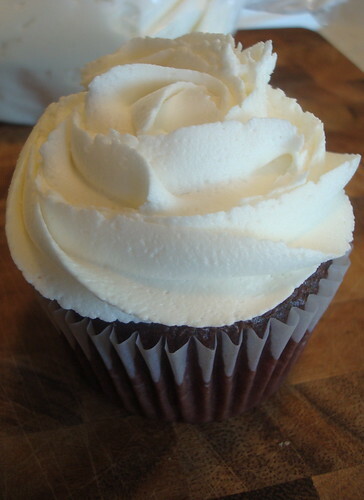 Add your frosting to the top. 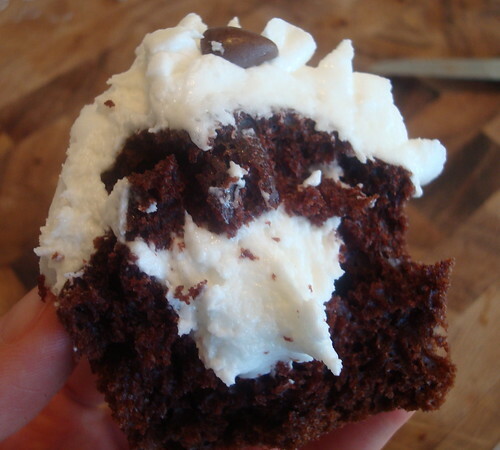 Using the piping bag to frost a filled cupcake is the best way to go because it will not pull and tug at the loose cupcake cap the same way a spatula might if you were to baste the cupcake. Add some decorations of your choice. Or a lot of them, if you want to. 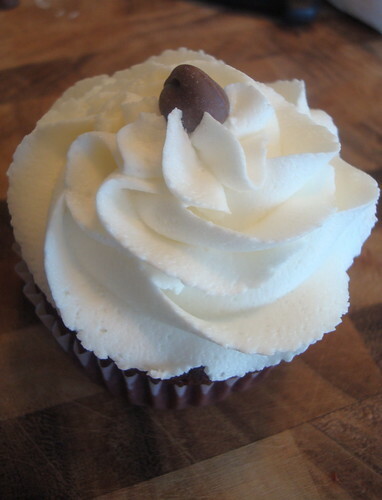 No one will know there is a delicious surprise inside unless you draw inspiration from a famous filled cupcake. That might give them a little hint. Now make sure you practice your most humble "thank you". 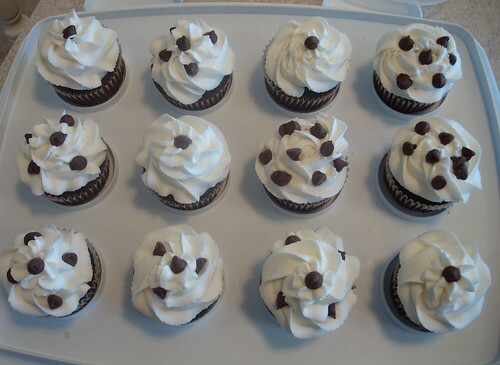 You put in a little bit of work for a big impact and your cupcakes are going to be a hit!